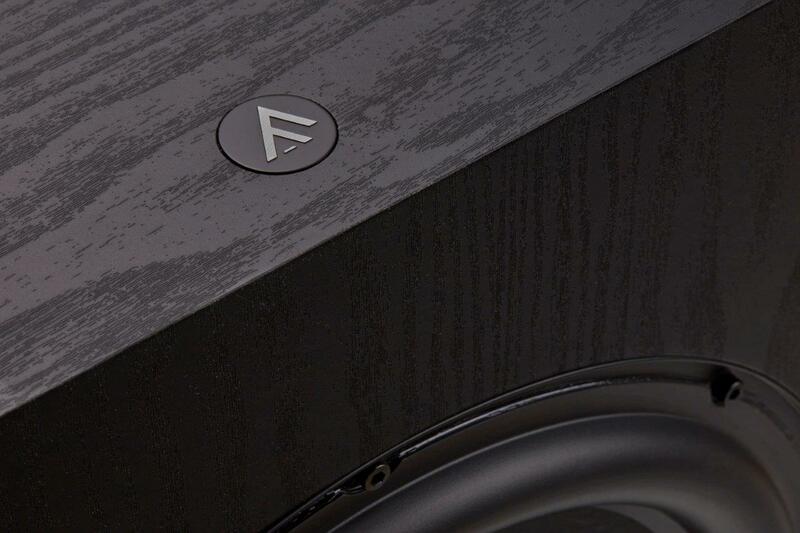 Recent entrant into the AV space, Fyne Audio has launched the F3 Series, a trio of affordable subwoofers packing blockbuster bass and classic style. Seismic bass doesn’t have to cost the earth, says Fyne and adds that its new Audio F3 Series deliver innovative DDX Direct Digital amplification, advanced DSP and the maker’s extensive know-how in driver and cabinet design at a keen price. From £299.99 for the punchy F3-8 up to the ‘mighty’ F3-12 at £599.99, the F3 Series subwoofers boast high power amplifiers, deep bass extension and a wealth of controls for convenient integration. The F3 cabinets are heavyweight and extensively braced, with large diameter ports using a mathematical derived flare profile at both ends for extremely low turbulence. The black oak finish cabinets are fitted with large, compliant feet that are kinder to floors and offer better room coupling than spikes. 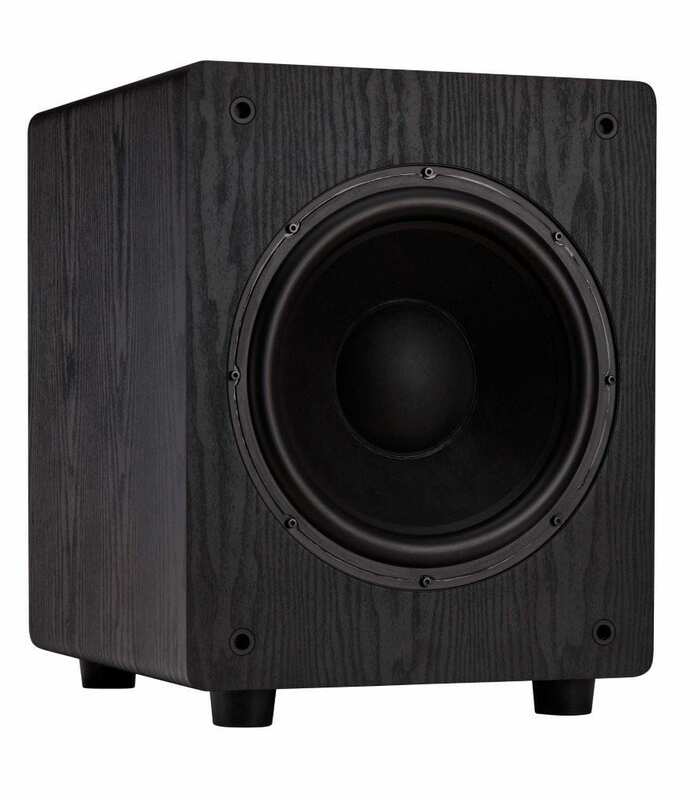 Fyne’s front-mounted F3 Series drivers major on deep bass with fast transient attack. The cone material is formed with a unique mix of fibres to create a light and stiff piston, with rubber roll surround and deep coil assembly affording long throw excursion and high-power handling. The maker says the range exploits the benefits of cutting edge electronic technology, using Direct Digital Amplification (DDX)throughout. DDX builds on Class D technology with higher power, better efficiency, lower RFI output and enhanced sonic characteristics. 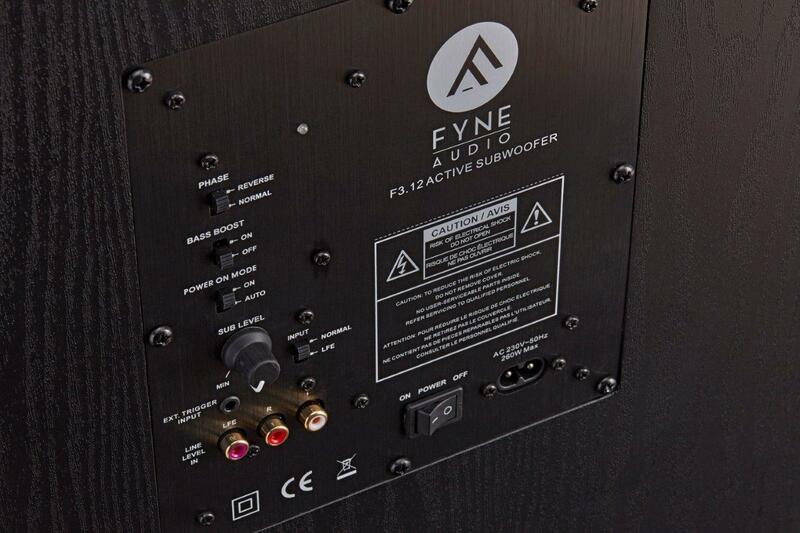 Fyne says the result is a clean, muscular sounding amplifier with extremely low distortion and plenty of headroom. The F3 Series advanced DSP engine has enabled control features normally only found in much more expensive subs, argues Fyne. In addition to switchable LFE / Normal input, phase reverse and signal sensing power on, all F3 subs boast automatic dynamic range management, overload protection and Fyne’s Bass Boost function. This feature gives a +3dB lift through critical movie LFE frequencies to deliver an immersive and engaging home theatre experience. All the units are available now. Described as potent, powerful and affordable, the F3-8 subwoofer delivers blockbuster bass performance from a compact and unobtrusive cabinet. Thanks to Fyne’s innovative 200mm (8in) long throw driver, 425W of Direct Digital Amplification (DDX) and advanced DSP technology, the F3-8 has been created to deliver accurate low frequency performance down to 35Hz from a downward ported cabinet just 26 litres in volume. Its innovative Bass Boost switch engages the full power of the DSP engine to deliver high-quality LFE effects for home cinema applications. For full-blooded home cinema action, the F3-10 subwoofer mates a 475W Direct Digital Amplification (DDX) with a 250mm (10in) driver in a mid-sized cabinet. Featuring advanced DSP technology, Bass Boost mode for LFE and a large, down firing low turbulence port for consistent in-room performance, the F3-10 is ideal for partnering with a wide range of home cinema speakers. With dedicated LFE and RCA inputs and filtering, phase control, a 12V trigger and continuous or auto sensing power on modes, the F3-10 brings the feature and performance of high-end subs at an affordable price. 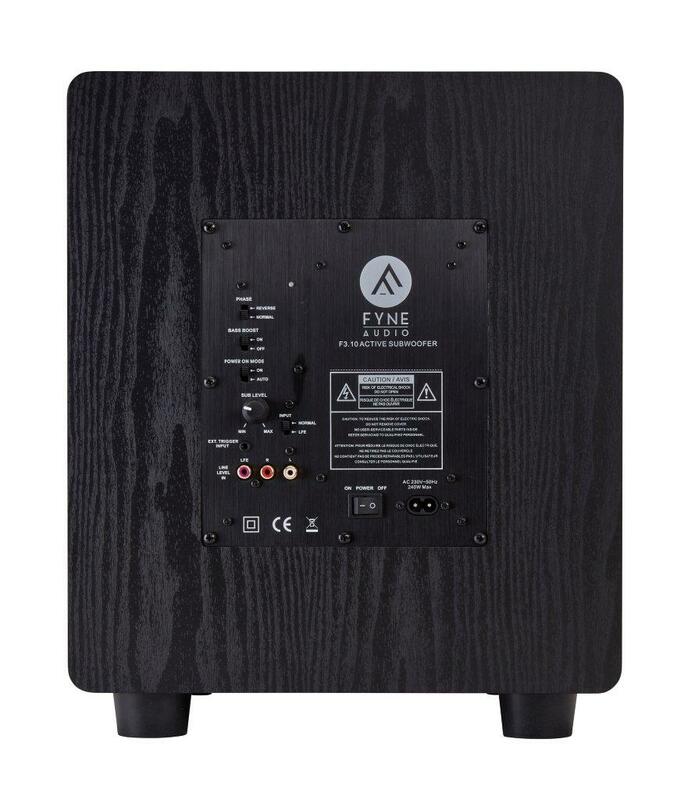 The F3-12 is Fyne’s state of the art F3 series subwooferfeaturing a massive 300mm (12in) multi-fibre cone driver, over half a kilowattof Direct Digital Amplification (DDX) and advanced DSP control with Bass Boostmode specifically for home cinema LFE. The heavily built, high rigidity MDF cabinetfeatures a large down firing port, compliant floor coupling mounts and a raftof features including phase control, a 12V trigger, auto sensing power on, andindividual LFE / RCA inputs and filtering. Fyne says the result is breathtaking bass performance as low as 28Hz, making the F3-12 the ideal subwooferfor larger scale systems.